Everyone has their preferred method of making coffee, but few people spend much time thinking about how to clean a coffee maker. People are increasingly diving deeper into the coffee culture to find exciting bean varieties. Flavor aficionados explore various roasts and tinker with different brewing methods. One often overlooked contributor to flavor is the cleanliness of your coffee pot. Some may balk a bit on coffee maker cleanliness, arguing that the buildup from yesterday (or last year) adds depth of flavor. At least there are some who hold steady to this belief in the case of dirty coffee mugs. We think that is just plain gross, and strongly advocate for learning how to clean a coffee maker for maximum taste and a hygienic cup of joe. Let's take a closer look at how coffee makers impact the flavor of your morning brew, how to get even the most complicated brewing machines squeaky clean. Coffee makers get dirty in two ways, through mineral deposits from water and the buildup of old coffee. When your coffee maker is full of either buildup or scale deposits, your coffee can have problems ranging from an "off" flavor to mold. Mold is a serious concern that can affect your health, and your coffee maker is the perfect environment for growing the bad stuff. Scale deposits come from various minerals in water, such as calcium and magnesium that accumulate over time in your coffee maker. The highest concentration of this buildup is usually near the heating elements but can be present in any area where water sits or travels. These minerals are present in almost all water, including bottled water. Scale deposits can cause unpleasant tastes in your brewed cup of coffee. Mastering descaling is key to understanding how to clean a coffee maker. Buildup can be from liquid coffee that has reduced to a sticky film, the coffee bean's essential oils, or loose coffee grounds that accumulate in different parts of your brewing equipment. This film doesn't only affect the coffee carafe but can line the inside of the pot from the filter basket downward. Learning how to clean a coffee maker properly can erase these off flavors and increase your brewer's longevity. The scale is particularly nasty, not only because it can add a mineral taste, but because it slowly destroys many coffee makers. Limescale builds up on heating elements, rendering them less effective. With less-than-optimal temperature, your coffee suffers. Also, scale clogs tubes and passageways inside your machine. For all these reasons, it's crucial to know how to clean a coffee maker. Let's look at the different types of brewing machinery -- there are many more options than you'd think. Determining how to clean a coffee maker depends on the brewer style. A simple stovetop brewer, like the Bialetti Moka p​​ot, has a much less complicated collection of parts than, say, a fully automatic espresso maker. Determining how to clean a coffee maker depends on the brewer style. 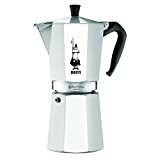 A simple stovetop brewer, like the Bialetti Moka pot, has a much less complicated collection of parts than, say, a fully automatic espresso maker. Almost all coffee makers experience scale buildup, except for a french press or Chemex brewer. These extremely simplified brewing vessels are essentially just containers that you manually pour hot water into. They aren't coffee makers. When you use these methods — which some people herald as the way to a sublime beverage — you are performing many of the steps that a coffee making machine normally would. You boil water, pour the water on the grounds, and wait for a moment to allow the brewing process to occur. Cleaning these types of brewers is simple. The main concern is to use a mild detergent and make sure you remove any soap residue. While you won't have limescale deposits in a glass brewing vessel, you will have coffee film. This should wipe off easily. Descaling may be appropriate for your electric water kettle, so make sure to wash that according to the manufacturer's instructions. For this discussion of how to clean a coffee maker, we are primarily concerned with appliances that you cannot easily wash in the kitchen sink. To do so, you should first read the user manual that came with your brewer. If you no longer have this, don't fret, most manufacturers have the same recommendations depending on the type of brewer and its interior mechanisms. Before you start dumping cleaning fluid into your coffee maker, you should take the time to understand how it works. Most coffee makers are reasonably simple. We will focus on automatic drip coffee makers, K-cup brewers, and espresso machines when learning how to clean a coffee maker. Automatic drip coffee makers are well-known to many people. In these brewers, a pump draws an amount of water from a reservoir to a second holding tank with a heating element. This element warms the water to the proper brewing temperature; then the machine siphons the water through a shower device onto a filter basket. Brewed coffee drips to a carafe below. When determining how to clean a coffee maker that is an automatic drip, focus on descaling the heat-element reservoir and inner tubes, and removing coffee buildup from the filter basket and carafe. These coffee makers function much like automatic drip, except smaller quantities of water heat up and a pod of premeasured coffee replaces the filter basket. You also have a heating element that develops scale. While the filter basket is essentially disposable, there still can be spilled coffee liquid and grounds in and about the pod location. Descale these machines, but take care to clean some of the hidden areas of the brewer that may be especially difficult to reach. An espresso machine operates differently than automatic drip or K-cup brewers. In a true espresso maker — not a cheap machine that just brews strong coffee — water is heated then forced through a brew head under pressure. Because the water gets pressurized, it's essential to ensure that the water passageways are thoroughly rinsed and back flushed before completing cleaning. Some espresso machines are more complicated than others, such as in the case of a fully-automatic brewer that includes a bean hopper, grinder, and milk frother. These machines often require brushing out dry accumulated grinds in addition to descaling. On the plus side, the machine doesn't have much exposure to coffee except for the brew head, which is removable and dishwasher safe in most cases. No matter what method you use, the following tips on how to clean a coffee maker can help you to brew the most delicious cup of coffee. Professionals, such as baristas and restaurant workers know how to clean a coffee maker. Certain chemicals are highly effective in dissolving limescale. Available commercial products include Impresa's Coffee Machine Descaler, which works on many types of machines. Another choice is a similar product by Essential Values. Both products contain two cleanings per bottle of solution, and the price ranges from $10 to $15 for a set of two bottles. Espresso machine manufacturers, such as Delonghi, sell specialized descalers for the high-pressure makers. Delonghi's all-natural desc​​aler is gentle enough for all types of machines, and the company touts that it is more effective than others on the market. Price ranges from $10 to $17 for a single bottle that contains five treatments. When you use a descaling solution, be sure to follow the product instructions, especially regarding rinsing. Also, some machines, such as espresso makers and more complex automatic drip systems, have a descaling setting. Vinegar is an all-around wonder cleaning product. It is a weak acid, so it safely dissolves many types of buildup. Most importantly for a coffee maker, it powers through scale without causing damage to plastic parts. If your coffee maker has a lot of scale, you'll want a gentle descaler that slowly dissolves buildup over several treatments. If you were to break down large chunks of limescale, you'd likely end up clogging your coffee maker. When using vinegar, just as you would with chemical descaler, it is important to thoroughly rinse the machine by running one or two full water reservoir cycles. In a K-cup machine, this can get tedious, but it is necessary, or your coffee will taste sour. While descaling and eliminating coffee buildup is essential to clean tasting coffee, it is also crucial to wipe and clean areas that do not accumulate scale. In K-cup brewers, there can be an accumulation of loose coffee grounds from when the machine ejects spent pods. Use a flashlight to take a closer look at this area when cleaning. Often a simple soft cleaning brush is highly effective for dislodging debris. For more complex machines, a portable vacuum with goose-neck attachment, or an air compressor are ideal tools for sucking up or blasting away coffee grounds. Always try to brush, wipe, or vacuum away dry material before using any wet cleaning method. If you jump right to a wet cloth, you might make coffee grounds harder to clean up. Your coffee maker's water reservoir is where the fresh water goes before brewing. In an automatic drip maker, the water doesn't stay in the tank for very long. In a K-cup or espresso machine, water may sit in the tank for a few days. Either way, you are unlikely to develop limescale unless you have extremely hard water. But, your reservoir is likely to get dirty over time. Keep your coffee tasting clean by washing the reservoir frequently. Mild dishwashing detergent is fine for this purpose, but make sure to rinse soap residue fully. Pay attention as well to the spout where water draws out of the tank. Usually, a blast of water and wiping with a soft cloth will help keep this area clean. A simple cleaning tip is to wash the carafe of your automatic coffee maker frequently. After every use, rinse out old coffee and clean with mild dish detergent. Take the time to scrub inside of the carafe with a sponge or dishwashing tool, as coffee oils usually do not rinse out with just water pressure. While most people rinse out coffee carafes after each use, the same is not the case for filter baskets. A key to how to clean a coffee maker properly is to look for areas that get the dirtiest and stay on top of them. These areas tend to have lots of ribbed and channeled linings to help guide water downward. Coffee grounds, brewed coffee, and eventually mold accumulate in these nooks and are difficult to remove with just soap and water. Rinse these baskets before each use, and give them a good scrubbing with a soft wet brush once a week. If you have a K-cup brewer, you may like the convenience of cleaning pods. These products claim to descale and remove buildup safely and without leaving a bad taste behind. Several brands are available, including Maxiliano's clea​​ning pods, which have received many positive customer reviews. With these, you simply insert the pods as you would with a coffee pod, and run a brew cycle into an empty mug. When you are cleaning, remember to wipe down the outside of the coffee maker too. Understanding how to clean a coffee maker isn't all about the insides of the machine. Although doing so might not affect the quality of your morning cup, kitchens can create quite a bit of ambient grease and grime that can turn any appliance into a dust magnet. Wiping a coffee maker down each day is a simple way to keep it shiny and new looking. A simple wet cloth is a perfect tool for surface cleaning. Antibacterial kitchen wipes are effective, too, but strongly scented ones can drip into brewing areas and affect flavor. 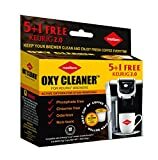 If you don't have chemical descaler or other coffee machine-appropriate cleaner, do not use full-strength plumbing or shower descalers such as CLR. These harsh descalers can cause damage to plastic and are much more difficult to rinse. Of course, never run any cleaner that foams, such as all-purpose kitchen cleaner, through any coffee machine. If you were to do so, you'd likely have to disassemble your coffee machine to remove the suds. Note, too, that CLR's website lists a bunch of cautions before using its product in coffee makers. If you are concerned that your cleaner may be too harsh, dilute it before running it through your coffee maker. When cleaning, a general rule is to always start with the most minimally invasive method first. A final cleaning tip is to change the way you make coffee. One of the best ways of learning how to clean a coffee maker is to make cleaning less arduous. Many of us treat our coffee machines poorly, which is a shame since we rely on these to work and deliver delicious beverages every morning. Take the time to keep your machine clean every day — just a few extra moments each day can make deep cleaning unnecessary. Stick to a descaling schedule, such as once a month. If you live in an area with hard or unpleasant tasting water, invest in a filter or use bottled spring water. Since coffee is 98 percent water, using quality water will improve taste and reduce buildup. Avoid distilled water. Distilled water will eliminate mineral deposits, but a small amount of calcium and magnesium make the water (and coffee) taste better. If your machine has a built-in water filter, change the filter as recommended by the manufacturer. This tip may be the most important step in how to clean a coffee maker. If you are bad at changing filters, remove and discard the filter as it could become a trap for bacteria over time. If you are looking for the best tasting cup of coffee, spend less time shopping for beans and focus more on your brewing method. Use the tips in this article and master how to clean a coffee maker. Regular cleaning provides optimal flavor and adds longevity to your coffee maker. Most coffee drinkers enjoy their favorite caffeinated (or decaf) beverage several times a day. Pause with each brew cycle and ask yourself if your coffee maker is clean. Could your coffee taste better? Would you like your coffee machine to last as long as possible? Brewing equipment can be expensive. Get your money's worth and experience ultimate taste with a regular cleaning regimen. You'll thank yourself every morning as you start your day with a great tasting cup. Previous articleCan a Cuisinart Coffee Maker Help You Start the Day Better?